Build your sales with this 3.5 Inch Domino Candy Topping Dispenser. This works great for any counter, as you can arrange your toppings dispenser display any way you like. Use your imagination and let it flow! Make candy and topping items accessible, convenient and easy to use, this ice cream toppings dispenser knows how to gather a crowd. 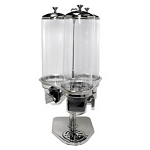 Whether you like your display sitting high or low, business won't be slow when you are serving yogurt toppings from this highly elegant stainless steel and acrylic topping dispenser. So go ahead, mix it up, by serving candies and nuts with delicious fun from this unique topping dispenser. Elegantly Durable Designed from heavy gauged polished stainless. Stainless Steel Resistant to scratches or other surface damage. Withstands high levels of heat without damage. Resistant to rust, corrosion and interactions with acidic foods. Food safe and easy to clean. Stainless Steel construction Provides durability and strength.